CNN: The Zionist News Network! You might as well call it ZNN, for Zionist News Network! While this article is about Wolf Blitzer, the CNN Fifth Column operative in the US, it would be appropriate to mention the spy network’s so-called Chief International Correspondent, Christian Amanpour, who ought to be nominated as the most biased, unprofessional, and pro-Zionist “reporter” of the year for her utterly false and dishonest coverage of the Georgian bombardment of Tskhinvali, the provincial capital of South Ossetia. August 17, 2009 ” Khaleej Times” — In October 2007, Defense Secretary Robert Gates coined a generic term to describe the most challenging combatants when waging unconventional warfare. He called them simply “the people in between.” Those people, a dominant force in mainstream American media, comprise a fifth column in support of those skilled at waging war by way of deception. The term ‘fifth column’ originated in the Spanish Civil War of the 1930s to depict forces that clandestinely undermine a populace — from within — to aid an external enemy. The term was later cited as a rationale for interning citizens during WWII, including Germans in the UK and Japanese in the US Israelis routinely refer to Arab-Israelis as a fifth column residing within what Tel Aviv describes as the Jewish state. Though misapplied in practice, the term remains an apt depiction of how internal influence can be wielded by a hostile force. In the Information Age, this fifth column focuses on those ‘in between’ domains where modest numbers can wield outsized influence. Television news is optimal as modern-day media operates “in between” a populace and the facts they require for a system of governance reliant on informed consent. The dominant influence of pro-Israelis in mainstream media is not the focus of this article. Here the focus is Wolf Blitzer at Cable News Network who typifies how “the people in between” manipulate public opinion in plain sight and, to date, with legal impunity. While working as a Washington correspondent for Jerusalem Post (1973-1990), Blitzer served as an editor of Near East Report, a publication founded by Isaiah Kenen, a registered foreign agent of Israel, who also founded the American Israel Public Affairs Committee. AIPAC coordinates a network of transnational political operatives known loosely as “the Israel lobby.” Neither AIPAC nor Blitzer has yet registered as a foreign agent in the US. As a writer for Hebrew language newspapers in the 1970s, Blitzer wrote under the name Ze’ev Barak—Hebrew for “wolf lightning.” The Blitzer media presence first emerged with his CNN coverage of the Gulf War in 1991 and the 1995 Oklahoma City bombing. Initially a military reporter for CNN, he became a fixture on television news as CNN’s Clinton-era White House correspondent until 1999 when he became a high profile CNN anchor. On one key media principle US law is clear: the airwaves belong to the public. The nation’s Founders knew that the preservation of self-governance depends on an informed populace. That’s why modern-day lawmakers enacted legislation to ensure that media outlets are not concentrated in a few hands, enabling a fifth column to shape public opinion around a predetermined agenda. Little could America’s first lawmakers have known that an ideologically aligned few would concentrate broadcast media in the hands of those who share an undisclosed bias. When Likud Prime Minister Ariel Sharon fell ill in Israel, Blitzer’s broadcast originated from Jerusalem. Likewise, when Israel invaded Lebanon in July 2006. Blitzer again relocated to Israel to focus viewer attention on the situation there. Zionism, Blitzer used the Situation Room to associate him with racism and anti-Semitism. Between the US populace and the facts they require for informed consent lies an “in between” domain. In that realm is found a network of like-minded fifth column operatives whose pro-Israeli bias works unseen — yet in plain sight — to shape public opinion around a predetermined agenda. That agenda-shaping “news” routinely features commentators from think tanks who share the same bias. What is the reach of this media-induced corruption of informed consent? According to CNN’s August 2009 advertising in The New York Times, this cable network delivers trusted news to 70.6 million television viewers in the US. What’s been the cost in blood and treasure of this undisclosed bias — not just to the US but also worldwide? The most trusted name in news featured National Security Adviser Condoleezza Rice in September 2002 when she issued a fact-free warning about Iraqi WMD: “we don’t want the smoking gun to be a mushroom cloud.” From the Pentagon’s perspective, “the people in between” are waging unconventional warfare. From the perspective of this enemy within, the only unconventional aspect of their deception is the fact that a long-deceived public is now learning about it—many of them for the first time. The displacement of facts with what a populace can be induced to believe is the very threat to personal freedom that the Founders sought to escape. The only modern aspect of this ancient form of warfare is the reach of the media technologies with which such deception can now operate — as with CNN — on a global scale. Rabbis blow rams’ horns known as shofars during a flight over Israel August 10, 2009. REUTERS/Yehuda Shlezinger/Israel Hayom. Image may be subject to copyright. “Dozens of rabbis and Kabbalah mystics armed with ceremonial trumpets have taken to the skies over Israel to battle the H1N1 flu virus, Israeli media said on Tuesday.” Reuters. This is the police; bang, bang, you’re dead! Indian Police Murders Man in Broad Daylight! The following photos show Indian police killing a hospital attendant in a market in Imphal, the capital of northeastern state of Manipur, on the border with Myanmar (Burma). The police had originally claimed that they shot dead Chongkham Sanjit, 27, after he fired on them as they chased him through the market, on July 23. The Manipur police alleged that they had found a 9mm Mauser pistol on the dead man, whom they said was a member of an illegal group. These photos, published by the investigative magazine, Tehelka, however show the special police force apprehending an unarmed Mr Sanjit, frisking him and taking him into a pharmacy as one of the policemen reaches for his pistol. The policemen are then seen dragging out the victim’s corpse and loading it on to the back of a pickup truck, next to the body of a pregnant woman, who was shot dead in the crossfire of an earlier police shootout. The apparent summary execution occurred in Imphal, at about 10.30am barely 0.5 km from the state assembly building where the legislators were in secession. The images may be subject to copyright. The caption were provided by Times Online, UK, with minor editing by Moderator. Shoot first, don’t worry about answering any question later! Image # 1. Chongkham Sanjit, 27, is arrested by police commandos in a post office in the capital of Manipur, northeast India. The red arrow shows his short journey from arrest to the place of his daylight summary execution. Image # 2. Mr Sanjit is apparently going willingly with the commandos who have arrested him. He does not appear armed, as was claimed by the officers after his death. Image # 4. Then Mr Sanjit is dragged by the commandos into the pharmacy, where he is apparently killed. Image # 5. Mr Sanjit’s dead body is then thrown into a truck. On the left is the body of a pregnant woman caught in the crossfire of an earlier police shootout. On behalf of the blog contributors and the readers, the Moderator has sent an email to the Dr Manmohan Singh, the Indian PM, demanding action to bring the criminal police officers to justice for the apparent summary execution of an unarmed man in their custody. On behalf of our Human Rights Blog readers, contributors and moderators, I write to express our outrage at the apparent summary execution of an unarmed man by the Indian Police Commandos, while the victim was in their custody, in Imphal, the state of Manipur, on July 23, 2009. We anticipate an immediate investigation by your government leading to the arrest and prosecution of the cold-blood murderers. iii. Training and arming unintelligent people to kill turns them into assassination machines. They become a deadly threat to everyone! In BORN TO KILL [anyone!] – Part 2, the logical fault line rears its ugly head [and tentacles] again. The following news item from BBC on-line reveals yet another act of aggression by the “dogs of war” on their own pack. An employee of the UK mercenary company ArmorGroup Iraq, British mercenary Danny Fitzsimons, murdered two of his mercenary-brothers-in-arms, Briton Paul McGuigan and Australian Darren Hoare on Sunday. The family of a man from Lancashire who has been arrested in Iraq over a double fatal shooting say they fear he may not get a fair trial. 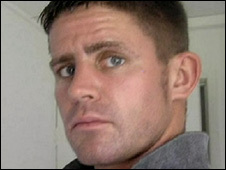 Security guard Danny Fitzsimons is being held over the death of two contractors in Baghdad’s Green Zone. UK company ArmorGroup Iraq said Briton Paul McGuigan and Australian colleague Darren Hoare were killed on Sunday. Mr Fitzsimons’ father Eric and step-mother Liz say they want the former soldier to be tried in the UK. He is currently being held in “pre-trial detention”, BBC correspondent Natalia Antelava said. Mrs Fitzsimons, who lives in Whitworth, said: “If he has done this crime then obviously he has to stand trial but, we would just want him to stand trial here. Embedded Media –>Mr Fitzsimons could face the death penalty if convicted of murder in Iraq. He went to school in Royton, Oldham, and was in the army for eight years, serving in Afghanistan and Kosovo. Mr Fitzsimons said he has been traumatised by his recent experiences in Iraq and had seen many people killed and injured by bombs. He is also accused of wounding an Iraqi and is continuing to be questioned by Iraqi authorities. A second British ArmorGroup employee was also questioned about the shooting but released later by police. An Iraqi military spokesman said the incident “started as a squabble”. A spokesman for ArmorGroup Iraq paid tribute to the dead men, describing them as “experienced, dedicated operators”. Mr and Mrs Fitzsimons said their thoughts were with the men’s families. “We do feel very very sorry and heartbroken for them… aren’t we? “We’re not saying that Daniel doesn’t have to face what he’s done, he does. He does have to face that. And we know he does. A Foreign Office spokeswoman said the Iraqi police were investigating. Mr President, how would you feel if they were your kids? It’s totally unacceptable, a decade into the 21st century, for the military powers of the world to occupy defenseless countries, and massacre their populations at whim. Anders Fogh Rasmussen, the former Danish prime minister, who has been appointed the new Secretary-General of the illegal NATO, visiting Kabul, declared that since the new orders were issued there has been “a drastic decline in the number of civilian casualties,” although he provided no figures. AP reported. “It is our clear intention to do everything possible to reduce the number of civilian casualties to an absolute minimum,” Fogh Rasmussen said at a joint news conference with Hamid Karzai. An Associated Press reporter and photographer saw residents of Kowuk bring the bodies of three boys and a man to the guesthouse of the Kandahar governor from their village, which is 12 miles (20 kilometers) north of the provincial capital, Kandahar city. The angry villagers shouted “Death to America! Death to infidels!” as they displayed the corpses in the back of a pickup truck. Afghan villagers look at the bodies of two children after they were allegedly killed in an airstrike by foreign troops in Kandahar, south of Kabul, Afghanistan, Wednesday, Aug. 5, 2009. Outraged southern Afghan villagers said Wednesday that a pre-dawn airstrike by foreign troops killed three children and a man in the latest case of civilian deaths at the hands of Western troops. The U.S. military said it had killed four insurgents on motorcycles in that area and could not confirm any civilian fatalities. The incident happened in the village of Kowuk, some 12 miles (20 kilometers) north of Kandahar city, said Abdur Rahim, a villager who said he lost three of his children in the bombing. (AP Photo/Allauddin Khan). Image may be subject to copyright. The U.S. military admitted killing four “insurgents on motorcycles” in that area, but refused to confirm any civilian fatalities. Abdur Rahim, the father of the boys and uncle of the slain man, told the AP that he heard a pair of helicopters circling over his compound at 1:30 a.m. Wednesday before they fired two missiles that hit his home. His brother and another son were wounded, he said. So, what about it, Mr President? Isn’t it time you withdrew American troops from Afghanistan, and put an end to the shameful butchery of the Afghan people? There’s literally NO difference between how the Israelis behave in the Jewish state today and how Nazis did in Germany 70 years ago. Israeli workers unload the belongings of a Palestinian family in a street after they were evicted from their house in the east Jerusalem neighborhood of Sheikh Jarrah, Sunday, Aug. 2, 2009. Israeli police evicted two Palestinian families from an east Jerusalem neighborhood on Sunday, drawing condemnations from Palestinians and the United Nations. Israeli police cited a ruling by the country’s Supreme Court that the houses belonged to Jews and that the Arab families had been living there illegally. (AP Photo/Sebastian Scheiner). Image may be subject to copyright. Jewish settlers moved in almost immediately after the Gestapo-like Israeli military/police forces clad in black riot gear evicted the 53 Palestinians who had been living in their two houses in occupied East Jerusalem since the 1950s. Israeli Jews enter a house after police evicted its Palestinian residents in the East Jerusalem neighborhood of Sheikh Jarrah, Sunday, Aug. 2, 2009. Israeli police evicted two Palestinian families from an east Jerusalem neighborhood on Sunday, drawing condemnations from Palestinians and the United Nations. Israeli police cited a ruling by the country’s Supreme Court that the houses belonged to Jews and that the Arab families had been living there illegally. (AP Photo/Sebastian Scheiner). Israel occupied East Jerusalem in 1967 and later annexed it, in the face of the world community. Senior Palestinian figure Saeb Erakat expressed outrage at the Israeli action. “Israel is once again showing its utter failure to respect international law,” BBC reported him as saying. “The operation to evict the Palestinians from the Sheikh Jarrah district of the city was carried out before dawn on Sunday by police clad in black riot gear.” BBC said. “I deplore today’s totally unacceptable actions by Israel,” the UN Special Coordinator for the Middle East Peace Process, Robert H Serry said. “These actions are contrary to the provisions of the Geneva Conventions related to occupied territory. “Our sovereignty over it is unquestionable,” Prime Minister Benjamin Netanyahu said last month. An estimated 250,000 Palestinians live in East Jerusalem and Israeli authorities have encouraged so far up yo 200,000 Jews to move to the occupied area. Why should the world treat Israelis differently to the Nazis?